Landscape with Charon Crossing the Styx, 1520-1524. Joachim Patinir, also known as Joachim Patenier (Dinant, Namur, Belgium, ca. 1480 – Antwerp, 1524), was a Flemish Northern Renaissance landscape painter and draftsman. He became influenced by the Antwerp School of the Dutch Renaissance painter Gerard David and also traveled to Italy to study this art. Patinir is considered the first Western artist known to have specialized in landscape painting; a pioneer in this genre, however his landscapes are not a separate subject but supported by religious themes. He incorporated precise observation of nature in his artworks. Patinir's landscapes were among the first small horizontal panels of any sort as paintings were almost always vertical in format before 1520. "Landscape with Charon Crossing the Styx" is one of his most famous paintings. 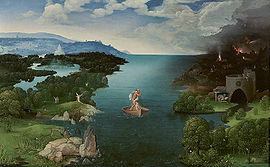 This work is an example of "World landscape", a panoramic imaginary view from a very high viewpoint that includes mountains, water (lakes, the sea), forests and fields, and small figures from a Biblical or historical narrative. It first appeared in a painting of Patinir dated in the 1520s. Patinir spent his short career in Antwerp. Landscape with the Flight into Egypt, 1515-1516. This page was last modified on 10 September 2018, at 23:26.